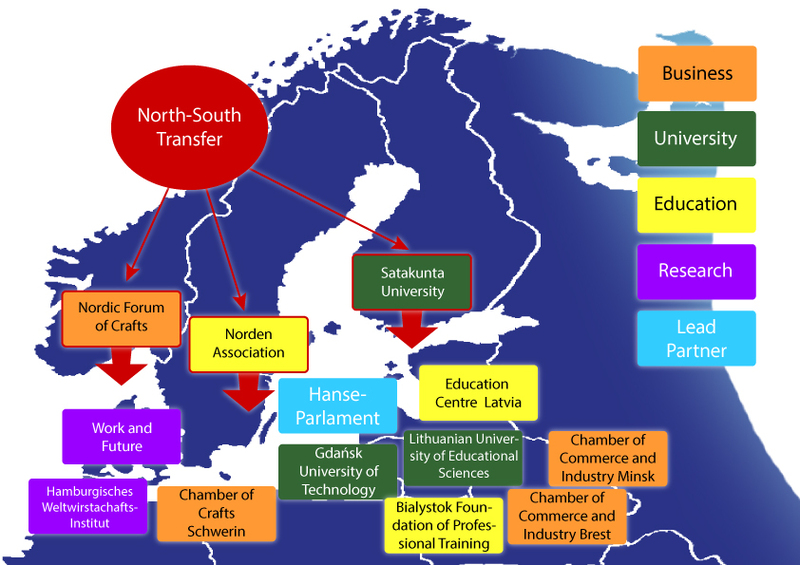 The Hanseatic Parliament is a Lead Partner and functions as a service head office and as think tank for the partnership. It tests new promotion measures with the partners, ensures the transfer to all partners and ongoing realisation by the partners (central development and decentralised realisation). In addition, PP1 is responsible for WP 5 "Strategy Concepts, Cooperation Agreement and Action Programmes"; Hanseatic Parliament is represented in all working groups and is the leader of steering group. PP1 is also responsible for WP 1 and WP 2, PP1 is responsible for the transfer of all results and measures to 45 chambers and 15 universities in all Baltic countries and follows the implementation advice. It ensures the sustainable continuation of funding also after the end of the project.